MONDAY, Nov. 28, 2016 (HealthDay News) -- Researchers say they've discovered a new way to detect and track brain injury related to repeated concussions in National Football League (NFL) players. Brain imaging scans in 14 current or former NFL players revealed elevated levels of a protein related to the body's immune response for brain injury, said lead researcher Dr. Jennifer Coughlin. She is an assistant professor of psychiatry and behavioral sciences with Johns Hopkins University in Baltimore. The NFL players, who had gone an average of seven years since their last self-reported concussion, showed high levels of the protein in eight of 12 brain regions examined, Coughlin said. If this new test is proven to work, it could provide a cornerstone for tracking the effects of repeated concussions on the human brain, Coughlin and her colleagues concluded. "We anticipate this technology is going to be useful in studying younger players and very carefully tracking how many concussions they've had related to play, and how that relates to the signal of brain injury revealed in our scans," she said. 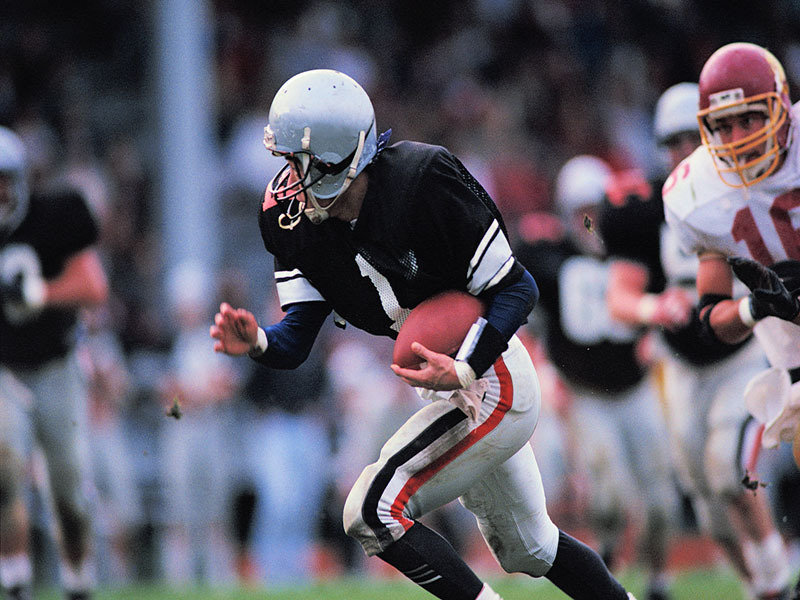 Repeated concussions have been linked to memory loss and mood disorders in NFL players. Autopsies have revealed extensive brain damage in dozens of deceased former players, many of whom exhibited erratic behavior prior to their deaths. The condition is known as chronic traumatic encephalopathy (CTE). In the early days of research, autopsy was the only way to verify brain damage, Coughlin said. More recently, researchers have tried to track changes in the white matter of living players using a technology that estimates water movement in brain tissue. Coughlin and her colleagues instead used positron emission tomography (PET) scans to track changes in a specific protein that regularly exists in low levels in the brain, but increases when the brain's immune cells respond to injury. PET scans were done on 14 NFL players and 16 non-players from a matched "control" group to detect differences in protein levels between the two groups. Although the study isn't definitive, the scans revealed higher levels of the protein in the brains of NFL players, suggesting ongoing inflammation in response to injury, Coughlin said. However, the scans revealed limited white matter changes in NFL players' brains compared to the non-players, and the athletes performed the same as the control group on neuropsychological tests, the researchers said. "We are seeing this signal from this protein related to brain injury and repair in young players who do not yet have memory deficits," said Coughlin. She added that, in the future, these scans "could conceivably be used to see who is primed for future neuropsychiatric problems." On top of detecting and tracking potential brain injury, the scans also could be used to test future treatments to help players dealing with the effects of repeated concussions, Coughlin said. Jonathan Godbout is an associate professor of neuroscience with Ohio State University's Center for Brain and Spinal Cord Repair. He said, if verified as accurate, these scans will be useful far beyond sports-related concussions. The scans also could track brain injury related to trauma from car crashes, for example, and possibly even damage occurring in a pre-Alzheimer's disease patient, Godbout said. The immune protein being tracked by the scan "has been implicated in a whole myriad of neurological diseases," Godbout said. "The thought that you can detect them in humans, and detect them relatively early, is important." The findings were published in the Nov. 28 online edition of JAMA Neurology.